Summer camps are a time for fun and learning. The camp learning environment is usually more relaxed than a regular school classroom—there are “campers” instead of students and “counselors” instead of teachers. In summer camps that focus on English language learning, counselors support campers, who use English in a meaningful way to play games, cooperate and collaborate with other campers, and take on leadership roles. 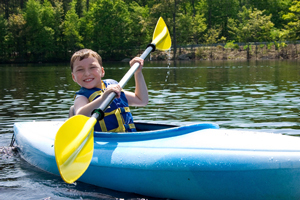 Campers are encouraged to speak English and given plenty of opportunities to hear English; however, grammar rules are not emphasized in this environment. The goal is for campers to use English to participate in activities and have a good time rather than be self-conscious about their language accuracy. Even if you are working with students in a classroom setting, you can bring this “focus on meaning and doing” mindset to communicative language learning activities. 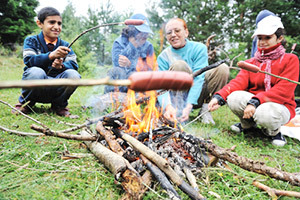 A common theme in summer camps is “nature and environmental conservation.” Activities related to this theme can help make young people more aware of their surroundings, teach them about the environmental problems facing their country and the world, and promote the idea that individual actions can make a difference. Topics addressed may relate to animals, conservation, water, collecting litter, recycling, or how to limit the use of plastic bags and bottles. Also, summer camp programs often use songs and chants, which are ideal for English language learners because they provide an enjoyable way to practice pronunciation and increase fluency. Activities in this plan involve environmental conservation chants. Use these activities during an English language summer camp or to add camp-style fun to science or social studies-themed lessons in your classroom. Download any audio files you plan to use. Have them ready to play on the output device. Most digital audio players have a “repeat” setting that will let you play a song or chant over and over again in a loop. If your audio player doesn’t have this feature, you can manually replay a track repeatedly using the player’s controls. Audio loops are ideal for language learning because they provide repetition for listeners. Two audio tracks included in this Activity Plan —“I’m a Fish” and “Refuse the Bag”— include audio loops. Counselors or teachers can let the looped audio play without interruption so learners hear the language again and again for listening comprehension practice. The listeners can also say the words quietly themselves or out loud with a group to get a feel for the sounds and rhythm. Race to recreate the song/chant - In small groups, learners listen to the audio loop and try to recreate it. As they listen, they write the words on a piece of paper, the blackboard, or a computer screen; groups make revisions as they continue to listen. When group members think they have created an accurate version, they check their work with the counselor or teacher. Groups can compete to be the first to finish. Unscramble the song/chant - A fun alternative is to give each small group set of words, phrases, or pictures that represent the lyrics in the audio track on little pieces of paper. (Counselors and teachers create the paper slips before the activity.) As they listen, campers rearrange the pieces of paper according to the text’s sequence. Memory test: Loop listening relay - Loop listening can also include movement. Rather than putting the output device at the front of the room to play the audio for all to hear, the counselor or teacher puts it in the corner of the room, or even outside, and plays the audio loop quietly. The counselor or teacher instructs each group to send one member at a time to listen close to the output device. That member tries to remember some part of the audio; he or she returns to the group and repeats the memorized portion, which is written down. Each group member repeats the process until the group has reconstructed the audio track. This approach works well for learners’ first exposure to the looped audio because the repetition is incorporated into an enjoyable activity. Making adjustments based on your their proficiency level, guide learners through a discussion about the meaning and environmental themes in each jazz chant. Before or after using the environmental jazz chants, ask campers or students to brainstorm a list of the important environmental challenges where they live. For more advanced learners, put campers or students into small groups. Support and assist groups as they write a letter or message to a person, local organization, or business about addressing one of the environmental challenges identified in the jazz chants or the student- brainstormed list.